The Society for Research into Higher Education (SRHE) held its annual conference in New Port South Wales from the 6th to the 8th December 2017. 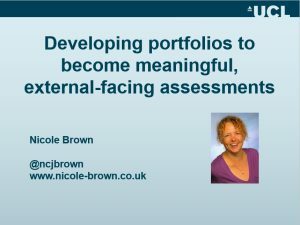 In this presentation, I talked about a collaborative project at UCL that seeks to develop portfolios to become meaningful, external-facing assessments. Higher Education institutes and staff are under more pressure to provide skills that go beyond the knowledge acquisition and deepening that Universities have been known for traditionally. The need to provide transferrable skills, to offer practical experience and to develop employability amongst students challenges existing assessment structures. External-facing assessments could provide one solution. I present a cross-institutional staff-student project in relation to the introduction and practical implementation of external-facing assessments. The aim of the project is to formulate dual purpose portfolios with structured tasks and evaluation criteria, which can then be integrated into or fully replace existing module assessments. In this roundtable contribution, I present findings from the first stage of the project, which include practical, ethical, legal and methodological issues, such as concerns around the use of technology and added pressures on students, the sharing of personal reflections with the public, and matters relating to copyrights and property rights. Download the full paper from here.